½ cup cooked chicken cubes. Sieve together the wheat-flour, egg, ½ tablespoon olive oil and a few pinches of salt. Knead into soft dough and let it set for a about ½ an hour. Roll it out flat, try to do it into a rectangular shape as far as possible, roll it till the thickness is a little less than how the cooked noodles should be. Cut into long thin strips like flat noodle, separate and let it dry. Boil water in a skillet; add the reaming olive oil followed by the noodle. Stir carefully occasionally, once cooked the noodle will itself start floating on the surface. Strain and keep aside spread on a flat surface. 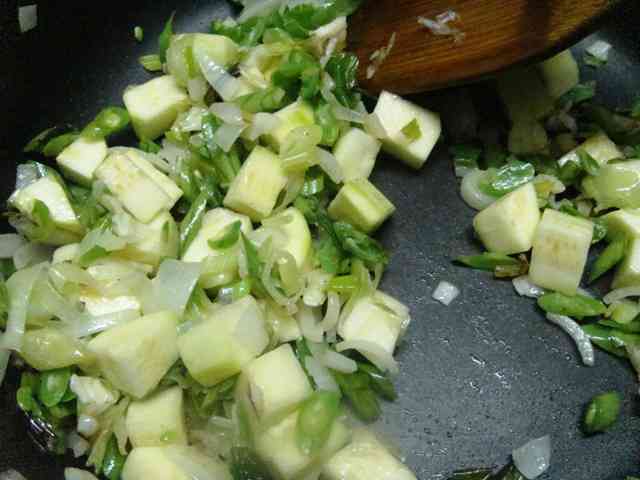 Take another deep skillet, heat a tablespoon of olive oil and to it add the diced vegetables other than coriander. 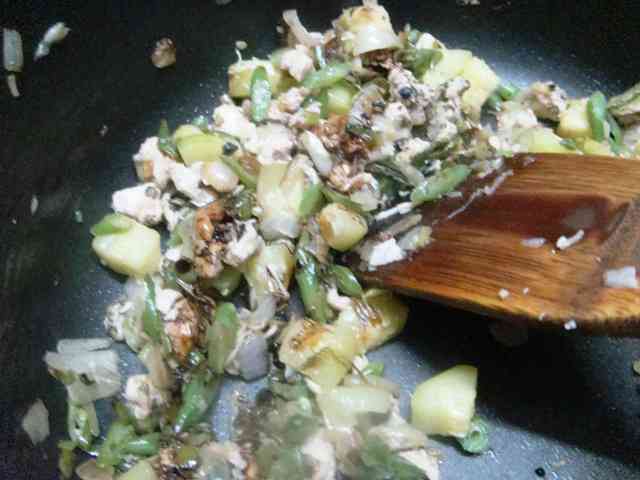 Add salt to taste, some crushed pepper and stir fry till the onions are translucent. Whisk in a tablespoon of each Soy sauce and Tabasco, give just one stir and pour in the entire chicken stock. Stir the mixture and bring it to boil, and then add the chicken cubes followed by boiled flat noodles and give the broth a gentle stir. 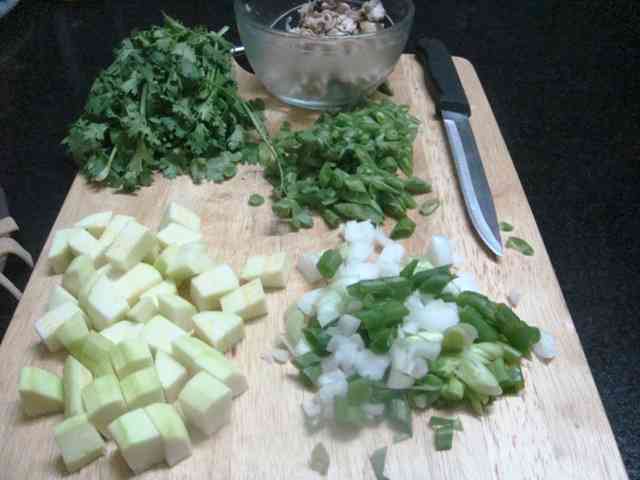 Top up with grated ginger, lemon juice, salt to taste, red chili flakes and the chopped coriander. Serve hot along with your choice of sauce & oil for further dressing (I would add a drop of extra virgin olive oil & Green Jalapeno Sauce). 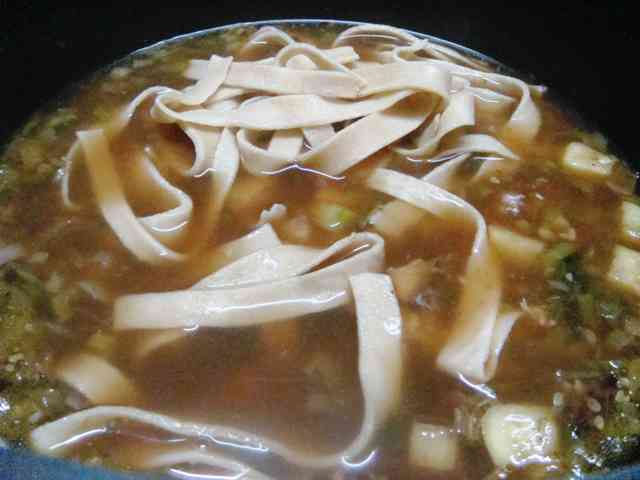 You may choose to use the readymade egg noodles easily available in the market. If like your soup bland you may skip on red chili flakes and Tabasco. Infact origianlly that is how it is served across Tibet, the spicy twist is my addition to suit my taste. Do not overcook the noodle. 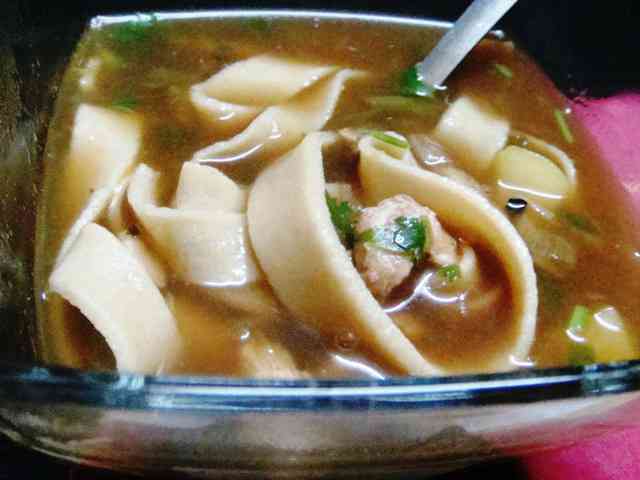 Do reduce the chicken stock to the require soup consistency, however the stock you are using is not very thick then you may have to add an extra cup of the stock to make two servings.